I was just wondering if anyone could be of assistance? I have a windows laptop (also Kali Linux), connected to it is a Hackrf via USB. Into the Hackrf is connected via SMA adapter to UFTC-T10 coax cable (for testing purposes), a Red Devil CB antenna mounted on top of the roof on a two story house. The antenna is cable tied to the TV aerial pole. I was wondering what I should be able to pick up on this setup. The reason for the cable is because that is what was laying around at the time. I can pick up general radio stations, I can pickup my CB and PMR radio, what are peoples thoughts on what I should be able to pickup on this setup? Hack RF can do 1MHz to 6GHz what you can pick up will be limited to your aerial type and what's transmitting in the area. So, what it is, I'm looking for an arrangement to pickup lots of frequencies. By frequency I mean, from an INFOSEC perspective, anything I can bring in, in terms of frequency. May that be key fobs, to satellite comms. So, I'm looking for something which fits in with a one size fits all. I have two computer science degrees to MSc level, focused on security. I'm interested in AI, Satellite Comms and SDR, antennas is something that I'm not so researched on and looking for advice from the more experienced. I'm looking for more technical specifications and pointers to reference material more than opinion, although experience and opinion is more than welcome. I'm looking for open source conversation on space technologies if that's ok. While taking into consideration networking from a CCNA perspective, ohms, electronics and duplex etc (https://www.youtube.com/watch?v=F9kKo190_oE). If only there were a one size fits all antenna, whoever creates such a beast will make a fortune . 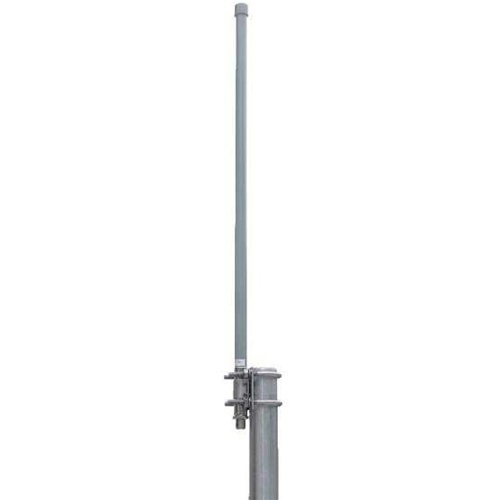 Wideband antennas such as the discone provide an acceptable compromise for the VHF/UHF section of the spectrum but these do not provide any gain over a simple dipole cut for a specific frequency . Only multi element antennas or colinears will give you gain and these are usually fairly narrow bandwidth. tuned antennas provide a certain amount of increased selectivity which reduces the level of " noise" fed to the Rx which in these days has to be an advantage, wide band antennas feed much more noise to the rx and as they will pass all signals on. the strong signals will produce unwanted overloading of the receiver front end and other effects such as intermodulation which results in the rx receiving signals which are a product of the true transmission and a strong signal on "the wrong frequency"
That will not help matters. It really needs to be mounted properly to work properly. The T10 coax is RG-6 & this again will not help, especially at UHF where it will loose a lot of the signal. 100 feet of RG-6 will lose around 55% of a signal between antenna & radio at 150MHz & that jumps to about 80% at 500 MHz. Also you will find your Baofeng UV-5R is of no help either. As unless you have a legally held licence, you cannot legally use it, even on receive here in the UK. Plus they have limited frequency coverage & are not scanners. So they clunkily work their way through only a few channels per minute, unlike a real scanner which scans 100's per minute & across a much wider area of spectrum. The problem with the DEF CON 23 hacking video that you link to above, is that it is American & they have a totally different system to us. Plus it is largely aimed at preppers & hackers. If you want to learn the basics of radio properly then the best place to learn & cheaply. Is to get in touch with your local amateur radio club & work your way through the licencing system. You should have no problems with the maths & physics side of things if you have an MSc. A lot of Hackspace clubs also do amateur radio courses & radio related work. I first learnt about radio from books, magazines & friends etc & then had to relearn everything properly again when I did an RAE (Radio Amateur Exam) course back in the late 70's. It is much easier to learn radio properly first, than to pick up a few disconnected bit & pieces & then have to relearn it all again & properly later. So there's no one size fits all, it's a case of focusing on a specific set of frequencies and using an antenna that is designed specifically for the purpose. So if I wanted to listen to CB radio I would use an Omnidirectional Antenna that operates between 26-28MHz. If I wanted to listen to Satellite Comms I would use a Directional Antenna. So what you are saying, correct me if I am wrong, antennas fall into two basic categories, 1) Directional or Beam Antenna 2) Omnidirectional Antennas. Would I be correct in assuming that. In radio, an antenna is the interface between radio waves propagating through space and electric currents moving in metal conductors, used with a transmitter or receiver. In transmission, a radio transmitter supplies an electric current to the antenna's terminals, and the antenna radiates the energy from the current as electromagnetic waves (radio waves). In reception, an antenna intercepts some of the power of a radio wave in order to produce an electric current at its terminals, that is applied to a receiver to be amplified. Antennas are essential components of all radio equipment, and are used in radio broadcasting, broadcast television, two-way radio, communications receivers, radar, cell phones, satellite communications and other devices. An antenna is an array of conductors (elements), electrically connected to the receiver or transmitter. During transmission, the oscillating current applied to the antenna by a transmitter creates an oscillating electric field and magnetic field around the antenna elements. These time-varying fields radiate energy away from the antenna into space as a moving transverse electromagnetic field wave, a radio wave. Conversely, during reception, the oscillating electric and magnetic fields of an incoming radio wave exert force on the electrons in the antenna elements, causing them to move back and forth, creating oscillating currents in the antenna. Yeah thank you, you're right. I understand that it needs mounting correctly, it was put up in a hurry for test purposes just to see what I could pickup, to be permanently fixed in place in the future. I have that cable while I wait for my RG58 50 Ohm coax cable, it was all I had laying around that gave me the distance I required. It was left over from an old ISP installation, it came from the demarcation point which I've re-purposed. Taking a radio amateur course and exam is my current plan of action. I've been onto the Radio Society of Great Britain website https://rsgb.org/main/clubs/club-finder/ and found a club to join. As for the Baofeng UV-5R, I didn't realize it was illegal to receive here in the UK, I thought it was only illegal to transmit, I'll read up on that further, thanks for that. Yes, I completely agree with you, they aren't scanners, a scanner if I simply want to listen is a better tool more fit for purpose. But, in the future I will be transmitting so it's there for future use. That's what my degrees are in, Ethical Hacking & Incident Response, Blue and Red Team. Yeah, you're totally right, I think the best plan of action, as you say, is joining a club, but I hope people will still jump in on this conversation and add their thoughts. Can anyone go into how the difference in ohms of the antenna and the cable will effect the received signals. The antenna is 50 ohms and the cable is 75 ohms as far as I'm aware. A common type of 75 ohm coaxial cable is cable television (CATV) distribution coax, used to route cable television signals to and within homes. CATV distribution coax typically has a copper-clad steel (CCS) center conductor and a combination aluminum foil/aluminum braid shield, typically with low coverage (about 60%). 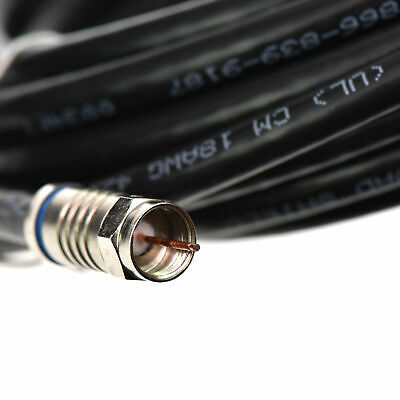 75 ohm cables are also used in professional video applications, carrying either base band analog video signals or serial digital interface (SDI) signals; in these applications, the center conductor is ordinarily solid copper, the shielding is much heavier (typically aluminum foil, and 95% copper braid), and tolerances are more tightly controlled, to improve impedance stability. Last edited by Chris P on Mon Jan 07, 2019 4:18 pm, edited 1 time in total.